Directed creation of all VoicePrism branding, communication, and direct sales materials. Responsible for concept, storyboard, visual design, scripting, casting and production of seventeen minute PTSD demo video which was seen by numerous top military personnel including the Secretary of the VA (US Department of Veterans' Affairs). 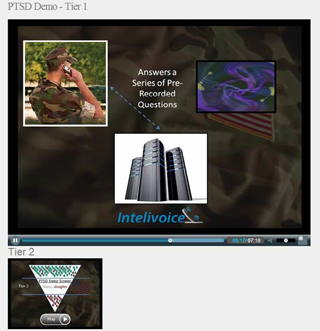 Click here to see the third section of the PTSD Video Demo (4 min).